If you have read About Me page you know that our desire as a family is to move in the direction of production. We long to shun the consumer culture that has become so prevalent in our day and replace it with sustainable practices. Yes, that means we will live these values even if they expand no further than the four walls of our home. However, my ultimate hope is that you will join us in this movement, that you will readily embrace the simple, and all the while begin to rediscover the true treasures in this life. It is this spirit of production that guides our home. As I’ve shared with you before…we haven’t always held this mind-set. It’s been, and still is, a work-in-progress! We take small bites. Do the best we can with what we have. And most importantly, we find encouragement through like-minded people. I bet you are beginning to wonder what the heck all of this has to do with homemade toothpaste!?! I’m getting there (wink). Well, one of the ways we achieve all of this in our home is through homemade products. 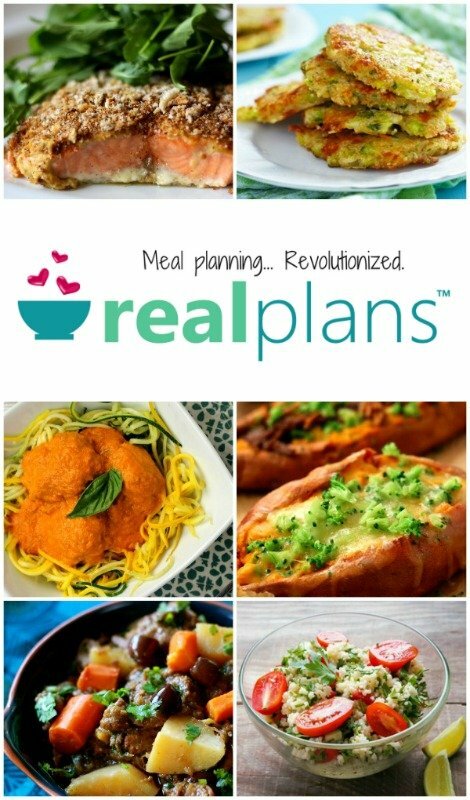 I have been sharing with you many of our tried and true recipes. From green cleaners to herbal remedies we hope to find ways in which to produce all things necessary for our health, enjoyment, and vitality. Toothpaste is just another one of those things (smile). Toothpaste, for some, seems to be a very difficult commercial product to let go of. But geez, have you seen the price tag on a tube of toothpaste these days? And with all the fluoride and glycerin and everything else in there that I can’t even pronounce! Homemade just makes more sense, for me at least. Mix all ingredients in a small bowl to form a paste. This recipe gives you enough for what I call a run through. Try it. See if it’s going to work for you. Then, if you like it, proceed to double, triple, or quadruple the recipe. Store it in an easy to dispense 2-4 ounce bottle at the sink, or just as you normally would with any commercial brand toothpaste. -This recipe is entirely flexible. Change it up. Try different “flavors” (i.e. essential oils) such as: vanilla-mint, lemon-mint, lavender, peppermint, or fennel. I purchase mine at a local health food store and online. 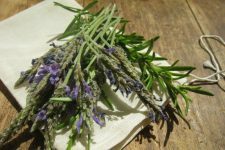 -Some have questioned the use of essential oils in this recipe. However, I say pure, high quality essential oils are of no concern. And just like with regular toothpaste, be sure not to sit around and eat it (wink). -We buy local raw, unpasteurized honey (find a supplier near you by searching this link). It’s a creamy, yellow color and it’s hard. Not like the stuff that comes out of a plastic bear. If you use liquid honey you may need to adjust the amount of baking soda because the paste might turn out too runny. -I will say the texture of the paste is different, not as smooth. It may require some adjustment. But the results are worth it! -For added natural whitening power, after brushing your teeth use a ½ hydrogen peroxide ½ water solution as a mouthwash and swish for at least 30 seconds. Please leave a comment and let us all know about your experience with homemade toothpaste! I am very excite to try this. I have almost all the ingredients at home, yet I won't be home for about a month, but this will definitely go on the to do list. I found this through Real Food Wednesday @Kellythekitchenkop. I have never even thought about homemade toothpaste! Most days I don't use any, just brush with water. I've heard that daily baking soda can be too abrasive for your enamel, but I haven't verified it. @Suzy That's great! And if you think about it, please let us all know how it goes for you. it keeps the oil content high so bacteria can’t grow in it sitting on a shelf. Great recipe! I haven't ventured into making my own toothpaste but your recipe looks pretty simple. I'd love to invite you to share this post at my link up, Healthy 2day Wednesdays. Hope you'll stop by! Love the idea of being sustainable practices, too! Thank you so much for sharing this recipe. I will definitely be trying this. cool!! i just recently started brushing with 1-2 drops peppermint oil. it's incredible and not mixing!! Interesting. Thanks for linking up to the Frugal Tuesday Tip! @Jacqueline I would be honored if you would link your post back to mine:) Share, share away! I've never made my own toothpaste – but now I think I'm going to have to try! Thanks for the recipe! @Micaela You're very welcome:) Let me know how it goes for you! I love this idea…and the use of honey. I've seen homemade toothpaste recipes before but haven't been brave enough to try them myself. You're right that for some reason it's a hard one to let go of, although we do use more natural toothpaste by Jason, rather than a conventional brand. And I definitely agree with you about moving towards sustainability in all different areas of our lives! Thanks for linking up to Your Green Resource! Have you tried adding Xylitol to it? If so, how much would you add? I am in the process as well, the first time i just used baking soda and peppermint essential oil..and water .yuck it was to salty, then i looked online a bit and stopped at a health food store and inquired. this time i used baking soda, xylitol crystals ( they didnt have drops and it didnt mix well-maybe next time dissolve it in hot water?) food grade hydrogen peroxide, food grade glycerine and peppermint oil, and a touch of water, better but still not good on your tongue, the lady at the health food store said to make sure the baking soda doesnt have aluminum and therefore you would be adding a heavy metal to your mouth, so it didnt say it had aluminum? Baking soda (NaHCO3) will never have aluminum in it. Baking powders can, depending on the brand. I had mouth sores, bleeding gums and tooth sensitivity. Dentist diagnosed caused as reaction to fluoride or SLS which is poison. Read warning labels on toothpaste then go to the internet, MSDS etc. The dentist told me to stop toothpaste and use baking soda(BS)instead. Done so for years. Not one cavity since I began using BS. Had many prior to switching. When I switched had small cavities which were too small to fill and the dentist was watching closely. These areas re-calcified themselves and are completely healed now. Being a military family I have been seen by numerous dentists and hygienists. Each time I go for a cleaning I'm asked what my hygiene routine is because there is very little for them to scale. They are shocked when I tell them BS. Each dentist has said the same thing which leads me to believe it is their frame of reference received from dental school. "Well, I certainly would NOT recommend that for others, but whatever you're doing keep it up. It's working for you! You have the cleanest teeth and healthiest gums of all my patients.". Does anyone else find that interesting? If that were their observation and their top priority is the best possible oral heath for ALL patients then why would they NOT recommend that routine for others? Think about it and if your interest is peaked and red flags raised after reading about the ingredients in commercial pastes you can see more interesting info at oramedia.com. Which states this: "The results indicate that brushing treatment with power or sonic toothbrushes may lead to significantly higher loss of demineralised enamel compared to toothbrushing without power or sonic support." This is crap. I have been a hygienist for a long time and I don’t appreciate you telling everyone to use BS. If it works for you then fine… Keep using it. But it sounds to me like you just have an allergy to one of the ingredients in toothpaste so if you think BS is the answer then go ahead. But that is NOT the case for everyone. There is a reason there is toothpaste these days. Much research and study are behind the benefits. We don’t live in the stone ages anymore. Toothpaste is for your health and benefit. If you have an allergy then that is really sad for you because you are really missing out. But I don’t want to see patients at work with destroyed gums because of your advise. I would never tell a patient that. And I don’t like the idea of homemade toothpaste either. This is something they would use in pioneer days and they all lost thier teeth. Use the modern science to help your hygiene! And it is very possible to brush too hard with a sonicare. It cleans better but if you push with it you will get the same effects of brushing too hard. Buy toothpaste from the store!!!M! Well that was a very useless comment. If you are a hygienist, wouldn’t that put you in a good position to tell us WHY BS or other homemade toothpastes are not good alternatives to commercial toothpaste? I’m not saying you’re wrong necessarily, but all you did was insult Johnna and everyone else who doesn’t follow modern dental practices. No one is going to listen to you if you don’t give us a reason to believe you. I look forward to hearing your reasons why commercial toothpaste is superior, and why using a homemade tooth cleaning product is detrimental. If you could leave out the cutting remarks and stick to mature, factual discussion, that would also be appreciated. I would think the flouride in toothpaste is needed for most people to prevent decay. There is also flouride added in most cities’ water. It is done for a reason – to prevent tooth decay. It is a minimal amount, but I think you should definitely do your research before you decide to do without it. MODERN SCIENCE?????? If that is the case, why are they so similar to ancient Roman practices? If you look at the most common “modern” tools found in a dental office, you will see that many are nearly identical to tools excavated from ancient Roman archaeological dig sites. Just something to think about. something I found about the abbrasiveness level of BS compared to other commercial products. According to this chart, indeed, BS would be the best way to treat our teeth ever. I was reluctant at first, knowing that myth that one shouldn’t use BS on teeth more than once every two weeks or so, but then I started reading, made my own toothpaste (which has BS, clay and all of the above) and I feel better and better. To think how much I have suffered and felt self conscious about my fragile teeth. I was just trying to hard and over-exposing them to the bad ingredients in toothpastes everywhere. Goodluck! I have tried a diluted hydrogen peroxide rinse but it seems to dry my mouth out and I get sores in my mouth. Someone recommended a sage rinse instead, which is supposed to have some cavity fighting properties and be good for the gums. Do you have an opinion on this? I absolutely LOVE your blog and these wonderful home-made, sustainable things! I am so glad I stumbled here. One question though… Isn't brushing your teeth with honey a little contradictory? You know, counterproductive? You are awesome! Thanks so much! Too bad it’s very tough to get the real honey around here. *sigh* I’ll keep looking. We started using homemade toothpaste using Coconut oil, BS and stevia and peppermint. Love it. Will try the next batch with raw honey and cinnamon. My gums feel so much better and my teeth love it. We had stopped using Floride toothpastes several years ago and started using the ones from the Health Stores. Very expensive. So glad to find a very good alternative that we are very happy with. Our two teen age boys are very happy with the results as well. I have the same question. Isn’t brushing so you can get all the sugar and other gunk off your teeth so they aren’t eating away at them all night? Wouldn’t brushing with honey add sugar to them? Just curious, would love to try something cheaper out but would like to know what the purpose of the honey is. Thanks. Hi Jess 🙂 I just replied to the comment above with my initial research on the topic! I am new to all of this but excited to get on the bandwagon. What about a dispenser? Not sure what to use. Any pointers? Hi Julia! We use a small mason jar and simply dip the toothbush in the mixture. Works beautifully! Sorry, I will need somthing else. I am not dipping my toothbrush in anything that someone elses toothbrush has been in. Way too much of a germaphobe for that. hahaha! I understand:) You could also try a little 2 oz squeeze bottle. We put ours in an empty soap-pump type bottle. Just make sure consistency is such that this will actually work 😉 I also add a little Thieves oil (well, a Thieves oil knock-off), a few drops of liquid minerals, and some calcium carbonate for a little extra remineralizing ‘oomph’. I have a husband and 2 of my children who seem to have weak teeth. We keep a spoon beside the jar and each person washes it with hot water after they dip their toothpaste out and use it. It works very well. i think a frosting bag would work great! I perhaps missed this, but how do u soften the raw honey to mix this and is there a chance it will re-harden? I just mix it right in and I find that it softens when mixed with the other ingredients. Thank you so much for this. 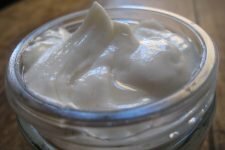 I recently found out that I have a sensitivity to ASA and other anti-inflammatories, and for some reason commercial toothpaste gives me an asthma-type breathing attack- I think because so many additives are derivatives of ASA… I’ve been brushing with just baking soda for a while but I’m excited to try this recipe. It’s so scary the things they put in our food etc!! I added cornstarch to the recipe and it made it really smooth. I have peridontal disease and I refuse to do the treatment. We are experimenting with MMS (miracle mineral solution). I love all thing frugal sustainable and I will do all I can to keep away from the mainstream. Hey, this might work! =) Thanks. I’ve been using baking soda for brushing and seasalt for garling since an intestinal infection restricted all sugar, even in toothpaste! I wasn’t fearful of this regime since my hygenist uses a “propy-jet” treatment which is baking soda blasted on teeth to clean them! Will try your recipe (sans honey) and let you know the resulting oral exam! I’m not certain that people with mercury amalgam fillings should be using peroxide paste or rinse, I’ve read about a reaction with the metal that’s a detriment to health. In my experience baking soda is too abrasive for daily use, even when taking care to brush gently. Our dentist did notice when I’d been using it for a while and told me to stop. Now I use an Oral B electric toothbrush (it’s just as good as a sonicare and costs less than half) and have read that brushing with only water is sufficient as it’s the brushing action that cleans the teeth regardless of what is being used, if anything. Sure enough, my 10 year old who dislikes all toothpaste had a recent visit with the dentist after 2 years and doesn’t have any cavities. The glycerin in all commercial toothpastes, including natural versions, is a detriment to oral health. Google for info. Tooth soap is an option (it’s just liquid or grated castile soap, don’t waste your money on tooththreads just buy Dr Bronner’s), it cleans very well and rinses away without leaving a film on the teeth like glycerin based pastes. Yes, castile soap has a small amount of naturally occurring glycerin but it’s very little. good to know what do you know about xylitol? Hello! I was just wondering, the Health Food Store did not have plain cinnamon oil, so I bought their cinnamon cassia oil. Would that still be ok in toothpaste? And, is NOW a good brand of essential oil? Just wondering! Thanks! In looking at the Mountain Rose herbs site, they have two different cinnamon essential oils…cinnamon bark and cinnamon leaf. Which oil did you use for this recipe? Thanks! Wow! That is interesting. I am slowly but surely getting my greener side to the forefront at home. It will take a while to convince the hubby but it will be more than worth it. I am going to have to give this a try. Thank you! Hi! Do you use regular drug store peroxide or food grade? Thanks!!! My first attempt to make homemade toothpaste! This sounds very interesting. I love that we have options to remove the yucky chemicals that are in our everyday lives. I do have two concerns with this receipe though. 1. Isn’t honey a natural sugar. If we use it in this receipe aren’t we going to decay our teeth? 2. Hydrogen peroxide is poison is it not? Might not be a good idea to add? Maybe the Hygienist should consider that just because a health and beauty Industry makes something and labels it as being safe- It doesn’t mean it is as they say. Lets all get along we are here to find ways to stay healthy and cheers to the wonderful person who wrote this recipe, keep up the great work. 1. I used to think that too, but sugar/food/bacteria on the teeth is not what causes tooth decay. Excess sugar and refined carb consumption is. I recommend the book Cure Tooth Decay by Ramiel Nagel. Enlightening! 2. Yes, it’s toxic but you have to ingest it to be harmful. Topically in small amounts is no worry. Excellent question, though, and I was worried about that when I first started using it. Since I have a lot of fillings from back in the day before I knew better, I limit the peroxide because I am concerned about ill effects with it coming into contact with the amalgam. I had to laugh at Hygienist. She’d probably be really upset at those aboriginal folks who have never seen a toothbrush, much less toothpaste, and yet have strong, white, beautiful teeth! Hi there I was just wondering if you and your family have been using this toothpaste for a while? I just want to be sure that I’m doing the right thing for my family. I don’t like all the junk that goes into regular toothpaste but I still worry that the BS and salt and whatnot will be too hard on my boys’ teeth. Anyhow, do your children use this recipe and how long has your family been brushing their teeth this way? I’m also a hygienist but I have found this all very interesting. I know many people that can’t tolerate tartar control tooth paste and it is so prevalent. Baking soda and salt work great but are more on the abrasive side. I always tell my patients if it works for them then do it! Toothpaste really isn’t all that necessary. It is the mechanical removal of the plaque and food particles that is important. This can be accomplished with floss and a dry brush! Toothpaste does make your breath fresher smelling but chewing a mint leaf will do that for you! Our office has been recommending an alternative to baking soda that is less abrasive and tastes a little bit better. It has been around for years but is hard to find. It is called Vince’s Oral Rinse. It can be mixed with water to make a rinse but it is more effective used and as a paste. It neutralizes the acid that the bacteria produce. Our office buys it from Lee Pharmaceuticals but I believe it can be purchased on Amazon. Wishing you all good oral health! I looked this up and this is the ingredients. We are trying to get rid of the chemicals. Not trade for more. All my husband had to brush his teeth with as a child was baking soda. It isn’t any more abrasive then the poisen in the tube. I used to clean my diamond rings with tooth paste and my jeweler had a fit! He said to stop using that as it is to abrasive! The first hygenist is brainwashed pretty well. You are right in that mechcanical removal is more important and so is good nutrition. I still have a couple of amalgums to get rid of so I will skip the peroxide in the paste for now. Maybe I sould us a little more honey to wet it and I migh try a little Xylitol in plce of some of the baking soda. I hate the thought of a salty taste. You are correct. There are chemicals in Vince’s Oral Rinse. But, I’m pretty sure Zylitol is a chemical, salt is made up of chemicals, so is baking soda and so is peroxide. Xyllitol is a natural sweetner.and baking soda and food grade peroxide doesn’t tear your health down like the chemicals in these oral products and in fact, they are use to promote health. Xylitol is a naturally occurring sugar that can be found in fruits and vegetables. This low calorie sweetener can by used in hot coffees, teas, cereals and fruits. You can even use this as a one-for-one substitution for regular sugar in your favorite cake and cookie recipes! An added benefit of Xylitol is that it helps to control cavity causing bacteria that form in the mouth, making it a sweetener that is actual helpful rather than harmful to your teeth. You really should do some research and know what you are talking about before you make a public post. I do know all of that, thank you very much, and I did do research. My only point is that all of these things are made of chemicals and saying that you want fewer chemicals is very general and unhelpful. Don’t use anything if you want fewer chemicals. Like I said in the beginning, dry brush and plain floss. can i have more information on the peroxide and the fillings? I am so going to try this onel. I have seen other toothpaste recipes that look nasty…..salt. Yuck! I have sensitive teeth, so not sure if this will work, but we are going to give it a try. I have been using Kiss My Face toothpast that I got as a sample and we like it but the price is not right. Thanks for all your advice. I am loving this blog page!! I think there is a food grade hydrogen peroxide, that might be preferable. I was wondering what is that tube in the picture that you are using. 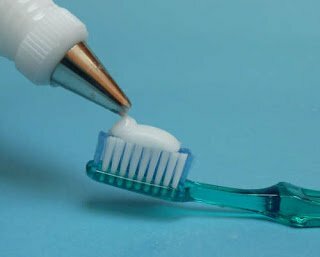 I have searched for a tube, squeeze container that I liked for my homemade toothpaste but haven’t found anything yet, that I like. That looks like an icing tip, but what is the container? Thanks. Vicky, I agree with you that that’s an icing tip in the photo. I’ve heard others say that’s what they use. Makes sense. Then just fold or role the opening and clamp with a paper binder clip (the clamp kind). You can buy food grade hydrogen peroxide. It is used internally for therapeutic/healing reasons. I have seen refillable toothpaste type tubes at REI store (and online) in the camping section. I believe they are actually meant for things like peanut butter, so the tip may be too big. They are called Coghlan’s Squeeze Tubes and are currently listed as $4.75 for a package of two. Seems like the perfect solution to the squeeze problem (since I want everyone in the family to have their own tube–yes, we are germaphobes too). Can’t wait to try the recipe!! baking soda is abrasive…..use it ….lose your teeth. Actually you should use food grade hydrogen peroxide…..in very very small quantities….not sold in stores. Sonic/electric brushes are a hype….people in earlier days had very poor nutrition…reason for losing teeth. In America we brush brush brush and our teeth look like hell….kids across the street have ugly teeth…..ugly enamel. My teeth were destroyed due to the poor techniques of dentistry in the 50’s…..I still have some mercury fillings. Dentistry….like any other profession is a Business…..they want you to keep coming back!!!!!! I have been very naive-until recently- about the truth in you tube videos and suggestions and recipes to make your own things. A lot of it is HYPE….and unrealistic….and fortunately will end up HURTING people. Very disappointed with the mis-information and mis-truths that are put out into the public realm. Every site that I visit….always….has something to sell……like buy herbs from this place…..buy this type of toothbrush…..buy this and the magic will happen……..don’t know of many people who are Magified!!!!! I understand why you could be frustrated… there are alot of crazies out there but if a web site is suggesting that you use something and you don’t know where to buy it wouldn’t you want them to give you options on where you can buy it from??? I have not thought of trying a homemade toothpaste. I make my own laundry soap though. I just mite try this too. Why would you brush with honey? Dosen’t sugar promote decay? I always thought honey was BAD for the teeth? Matter of fact, every time we eat honey, we make sure to brush our teeth. ?? This recipe sounds great, but I’m a little leery. I’ve heard that peroxide has a toxic reaction to the silver fillings in your teeth. Does anyone know if this is true or is it maybe possible to replace the peroxide with something else? This is a great recipe. I don’t think honey will cause tooth decay because it is a natural oxidizer. However what I do know is that using essential oil, especially Ceylon Cinnamon Leaf oil very effective because it is an extremely potent anti-bacterial and anti-microbial. 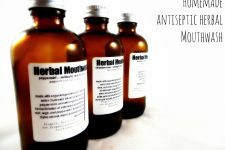 It has been used for centuries as a natural mouth wash. It helps prevent/reduce gum disease and fight bad breadth. Very interesting. I will keep it in mind when we can no longer afford to buy toothpaste. Lack of toothpate in the early 40s’ lead to traumatic extraction by 3 yrs old and numerous fillings later. School dentist used a foot powered drill and I bit him to stop the torture!!!!!!!!!!!!! I made and tried this today. I do like this recipe. I had already been using peroxide and baking soda, and been trying to get around to throwing coconut oil in there somehow. Thanks for the tiny recipe! I hate to commit to large portions of something, only to have to dump things that didn’t turn out to be great for me. My difficulty in make-my-own versions is the dispenser. What to put the stuff in, and how to get it back out in a sanitary way. I like the idea of the soap dispenser type container. I love your site, I’m dying to make the shampoo and cream but I’m vegan so what would you suggest to replace the honey in this reciepe? I have finessed a toothpowder recipe that I’m quite happy with just this week in fact. It can be made into a paste with the addition of melted coconut oil or simply with water just prior to brushing. It doesn’t contain peroxide which I would not use with metal fillings (why take a chance with this when the current research indicates a negative reaction? Mercury amalgam is nothing to fool around with!) but does include a fair bit of Xylitol, a natural decay preventative. As an aside, I also make my own laundry soap and deodorant. Barely a chemical comes into our home these days, it was a easy transition and certainly costs a great deal less! I love this recipe! I’ve made it many times and even with other flavors. But it continues to turn yellow after a few days in its airtight container, no matter the essential oil I use. Anyone know why? I have been making a really similar recipe to this one for awhile now and never had it turn yellow. But this last time I made it, it all turned yellow after about 24 hours. I’m trying to figure out why as well. I’m wondering if the coconut oil I used has been in my cupboard for too long. I have a newer bottle, but the one I used might be a little old. I read this entire thread of comments! (And I loved every minute of it! LOL). I have been making my family’s toothpaste for a few weeks now, and we really have loved it. My recipe is very similar, with a few small differences: 1)I haven’t used raw honey in it yet 2) I’ve been using Stevia instead. 3) For the hydrogen peroxide, we use a tiny sprayer, and just do a little spray on our ‘toothpaste’ on our brush, before we start brushing. We wet the toothbrush prior to toothpaste application, so it’s diluted in that way. So, to recap, I use equal-ish parts of baking soda and coconut oil (1/4 cups each, for our family of 6), 2 little packs of Stevia, and 10 drops of peppermint essential oil. I am not worried about the baking soda being too abrasive. In fact, if the coconut oil needs to be warmed to liquify to mix with the baking soda, and it’s warmed enough, the baking soda really ‘melts’ and that gritty goes away, even once the toothpaste solidifies some. What I *AM* really confused and on the fence still about, is the Xylitol. I have been researching this to death, and for every piece I find that eases my worries about using it, I find another that really discourages it. On the one hand, I keep reading it’s really necessary to help prevent cavities. But then, I read it’s far from natural…..it’s very much treated with chemicals first. And of course…..the worry it is any kind of carcinogen or bad for our overall body health. I realize we aren’t eating it, but I would think our mouths have high absorption. I wish I could find an answer and feel settled about it. I’m also on the hunt for REALLY great kids multi-vitamins, without ANYTHING else bad or questionable in it (such as gelatin, for ex.). My kids are AWESOME eaters….dream kids, who love all kinds of vegetables, and heathy foods from all of the food groups. Still, I want to be sure their vitamin bases are covered. But….we were talking about toothpaste. Vitamins are another topic. This has been very informative & fun! My question where do u get “hard” honey? First time. I added some freshly ground cloves because I don’t have essential oils. I wonder if this is a good idea. I can’t say it tastes good at all but biologically speaking wouldn’t cloves kill bacteria? How about cinnamon, ginger, sage… instead of essential oils? Oils are to make the paste more palatable? Hi There, I’m really hoping you are still checking comments on this thread. Last year a very exciting study came out showing the benefits of using raw honey for oral health. It’s posted by Dr. Mercola who is pretty well respected in the all-things-natural dept. I make my own toothpaste using raw honey and some of the same ingredients you mention, and it was even approved by my traditional dentist (he is open-minded with natural oral care). In Sri Lanka, we have naturally produced toothpaste using Ceylon spices. Ceylon Cinnamon and Cloves are great ingredient for natural toothpaste. These spices are mostly used in cooking. Its giving additional health benefits than taste. We are native Sri Lankan supplier of 100% natural Ceylon spices.